Seaside Invitations: Put a stamp on it! We are seeing a new trend hitting the wedding scene and that's postcards as your response cards. It feels like every time I turn around postage seems to go up. Using a postcard in place of a traditional response card will help save you money! The cost of a postcard stamp is now $0.28 (regular first class stamps cost $0.44). Using a reply postcard not only helps to save in postage but you save in paper costs, as well, because there is no envelope needed. A great benefit of using Seaside Invitations as your invitation designer is we assemble your invitations and place the postage on your reply cards. A great way to add a bit more flair to your beautifully designed invitations is the use of vintage stamps. 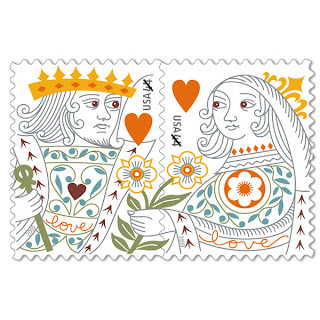 Most people will need the standard wedding stamp when mailing out their invitations. The cost of these stamps has gone from $0.59 to $0.61. This stamp covers most invitations that include a few enclosures and/or the popular pocket or pocket-fold. If you are mailing a square invitation, then the post office will add a surcharge of $0.20 to your item. In the grand scheme of wedding planning an extra $20 on 100 invitations for postage is rather small potatoes but you don't want to be surprised at the post office. The best thing to do before purchasing the postage for your beautiful invitations is to take one fully assembled invitation to the post office and have it weighted. They will tell you exactly how many stamps you need to purchase.